MT: The present Black Box belongs to the namesake series of works by Sotiris Papanikolaou. Here, Papanikolaou creates a space where the background image resembles a microcosm of biology. 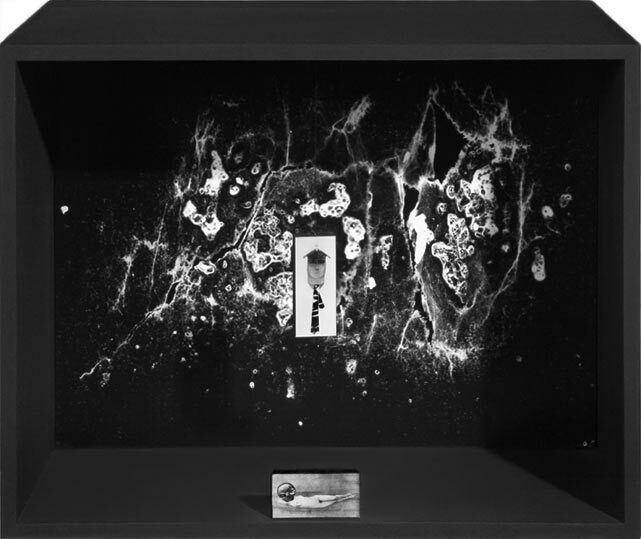 The image is made in the darkroom with the technique of photogram, using saliva and granules of sugar and salt. In the foreground of the box appear two micropictures. In the first micropicture, which is firmly positioned in the center of the floor, he appropriates Hannah Höch's collage Fremde Schonheit I (Strange Beauty) of 1929 and presents in a sarcastic mood a seductively reclining naked white woman on the head of which she mounted a photograph of a wrinkled face whose eyes look magnified through the oversized spectacles . Just above it in the center of the space, is suspended from a thin thread the second micropicture, which appropriates a painting of George Michelakakis from his Dictators series. The painting presents a tie that capitulates in a male face with features that are minimized in size in order to convey the sense of power and aggression. Therefore, this Black Box sarcastically refers to a widespread social situation, in which the passive female's endurance of the male's violence is considered to be natural.